WHM: Maps Exercise Question 3 - Who made this map and why? 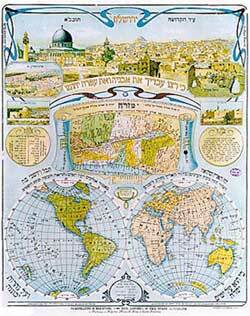 As you work through the exercise, youll see four maps of Jerusalem. Look at each map carefully and then try to match it with its producer or purpose. As you do, think about which details the mapmaker chose to include in the map and why. an artistic image produced for 19th-century pilgrims interested in Biblical Jerusalem? produced by the Palestinian Authority? produced by the U.S. Central Intelligence Agency (CIA)? a traditional Jewish decoration (Mizrach) indicating the direction of daily prayer?